On December 9, 2014, Jupiter is retrograding in Cancer. Negative impact of Jupiter increases if it retrogrades while it is exalted. In which condition is it now? Unveil all with astrologer ‘ Pt. Hanumman Mishra’ . Jupiter is known as the most auspicious planet among all. Generally, Jupiter does not give negative results and when it is exalted, its fruitful results increase. However, when it is debilitated or retrograde, its benefic result decline and these negative results increase further, when it undergoes retrogression while it is exalted. 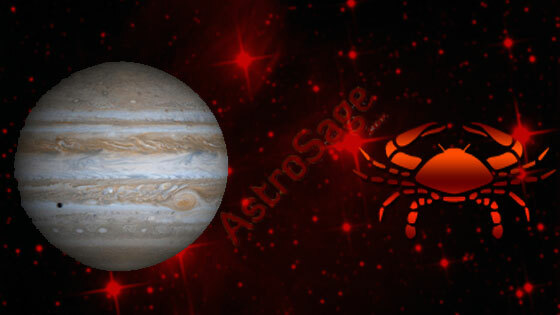 At present, Jupiter is exalted and on December 9, 2014, it will retrograde. According to some scholars, it will give unfavorable results. This will continue till April 9, 2015. As a result, people who are associated will religion and spirituality will get negative results. Once again, any saint or sage will become come in the news. Working system of education department or ministry might get questioned. Question paper of any examination might get leaked. Agriculture is expected to get affected negatively. Lack of harmony is possible in the country and battle in expected in any neighbouring country. If your spiritual, you won’t get affected, however; caution is needed. Luxuries and comforts might fall down. If you were in the mood to buy new home or vehicle, hurdles are foreseen in that. This phase is not good for bringing changes in work or business. Self confidence might decline. You will get less time for social activities. Refrain useless journeys. Concentrate on managing your domestic life. Unexpected expenses foreseen. Avoid spending unnecessarily. Lack of harmony is foreseen in family life. Take care of your personal life too. Cancerians need to take care of their health. You might feel confused or blank. Hurdles in income are also possible. Lions will turn ideological. Expenses will decrease. Opponents will remain inactive and you might on distant our. Don’t insult elders, teachers, and seniors. Your efforts might face some hurdles. Friends and brothers might not provide the expected help. Avoid getting into tiffs. Work environment might change. Beginning new endeavors in this phase is not good. Take care of your name & fame. Try to keep up your enthusiasm and confidence. It is suggested to take care of your family. Stay away from deceivers. Try to avoid distant journeys. Sagittarians will have a peaceful mind. Financial troubles will end. You are expected to gain sudden wealth, however, make sure to keep a check on your health. You will feel inclined toward spiritualism. Take care of your personal life in this phase. Partnership matters should be dealt with caution. This is the time to take care of your image. Aquarians, your hard work will pay off very well. However, refrain unnecessary legal issues. Don’t lend money to anyone. Jupiter retrograde in Cancer horoscope suggests avoiding useless differences with others. During this time, your decisive abilities might get hampered. It would be good not to associate with new or complex work. Jupiter retrograde in Cancer astrology suggests being self dependent rather than depending on friends.